He is Abu’l-Qasim al-Junayd b. Muhammad b. al-Junayd al-Khazzâz al-Baghdadi, born in Baghdad around 215 and lived most his life in that capital until he died in 298 AH. Junayd of Baghdad (Persian: جنید بغدادی) was one of the most famous of the early Persian Muslim ascetics originally from the city of Nahawand in Persia. اسم علم مذكر، وهو مصغر تصغيراً عربياً لكلمة “جُند”، وهماً منهم أن جند مفردة. وجند كلمة فارسية الأصل من “كُنْد”. اشتهر الاسم بين المتصوفة تشبهاً بالصوفي الزاهد جنيد البغدادي (ت 297هـ). He was from the EARLY generation of Muslim ascetics (also known as Sufis, though this is NOT a Shar’ee term), that was praised by scholars like Ibn Taiymiyyah, Al-Dhahabi, Ibn Al-Qayyim etc. UNLIKE the later generation AND >>> today’s generation of Sufism <<< which is nothing but heresy, chanting and superstitions. His teachers were his maternal uncle Sari al-Saqati and al-Harith al-Muhasibi, two scholars of the past known for their great piety, Abu Thawr the student of Imam al-Shafi’i, Abu ‘Ubayd al-Harawi the multi-fold scholar, Muhammad al-Qassâb, Abu Bakr al-Qantari and Yahya b. Mu’adh al-Razi, all of them called Sufis, and others. All his teachers were in general upright men and had sound beliefs – Insha’Allah. Take for example his maternal uncle, the famous Sari al-Saqati who is claimed falsely today by pseudo-Sufis. al-Junayd, the nephew of Sari who was his first teacher, related that his uncle asked him once to whose assembly he was going when he left him. Abu Talib al-Makki explained this as: knowledge of the tradition and Sunnah should come first, and afterwards practicism of ascetiscism and devotion. Being well-grounded in orthodox ‘Aqidah is important before one wants to become a devotee. For this reason, many claiments to Tasawwuf are spoken ill of and the name ‘tasawwuf’ was first looked up with suspicion, nowadays it is put on a par with heresy and innovation. May Allah protect us from heresies and innovations! Anyway, here you can see that Sari al-Saqati cared about his family’s religious condition, or better conviction: he advised his nephew and warned him for al-Muhasibi’s involvement into Kalâm and debating the Mu’tazilites. Instead, he encouraged him to take from al-Harith ‘the One who Counts’ (lit. al-muhâsibi that is: the accountable, who reckons himself) the discipline for which al-Harith was known for; such as his devotion, piety, modesty, restraint etc. Al-Harith al-Muhasibi was a pious scholar, knowledgeable in many sciences, except that his involvement into forbidden and blameworthy sciences, as infected by the Mu’tazilites with whom he debated, made him a paria at the end of his life. He was criticized heavily by the Imam Ahmad, which was justified. His books such as the Fahm al-Qur’an contain innovative stances on the Attributes of Will (i.e. the sifât al-ikhtiariyyah), which he took directly from the Mu’tazilites or from Ibn Kullâb who was prominent for negating such Attributes. This is sound ‘tasawwuf’, if with Tasawwuf is meant: purifying the heart, performing a lot of devotions, regularly remembering Allah, taking the Prophet’s outward example in clothing etc. It means also having sound convictions, for deeds will rise to Him and accepted if well-grounded beliefs are sound. If one believes in the unification of man with Allah, and we seek refuge from such blasphemy, whatever prayer performed or remembering directed to Allah, it will be rejected and you shall enter the Fire without a doubt! Junayd al-Baghdadi passed one day by a group of Mutakallimun who were speaking in a negative mode about Allah, the Exalted. That is: they were discussing the Creator in a negative theology as the Mu’tazilites, Ash’arites and many other sects do, i.e. mentioning the sifât al-salibiyyah in detail and broadly by speculations. He means: to say for example that Allah is not inside the creation, outside the creation, not above, nor below, not left, nor right, He is not this or that.. etc. is a fault in itself, for Allah, the Exalted, should not be described as such. Junayd saved himself from falling into innovations and doubts, and would not be persecuted as al-Muhasibi was by Imam Ahmad and his followers. As such, it is no surprise to see the scholars of fairness and in-depth knowledge such as Shaykh al-Islam Ibn Taymiyyah and his disciple the Imam Ibn al-Qayyim speak highly of this true saint. Indeed, the statements sûfis made about him such as ‘Shaykh al-Tariqa’ are justified, in so much he was truly upon a path that was orthodox and of which he was a leading personality. – a refutation of those people who are supporters of Wahdat al-Wujûd. And for this reason Ibn ‘Arabi burst out against this Sunnite. There is no might nor power then with Allah! Such a statement of Junayd about Allah’s Tawhid was expressed by the Imam because of the first Ittihadi and Hululi people that became prominent. It was in Junayd’s time that this evil came out. When this happened in Baghdad, the orthodox scholars supported by the Caliph came out against the sûfis who supported these false beliefs. It happened that an Imam stood up, the Malikite Qadi Isma’il b. Ishaq, who was a student of Ahmad b. Hanbal and other eminent scholars. He was also a descendant of the great Basran scholar Hammad b. Zayd and considered in his time the Imam of the Maliki Madhhab. The scholar who made much effort against them was the Hanbalite Ghulam al-Khalil. All sufis it is said were accused of heresy in public, incl. the Imam Junayd. But Junayd was known in public for his devotion, sound beliefs and intellectual standing as a jurist. Then again, some people accused him of that and he had to be confronted with the authorities so that they could question him. When he stood in court he said that he was simply a jurist, and thus pardoned. The rest were however questioned more. At the end, most were freed too after being questioned and none has been hurt in any way as the Mu’tazilites did to the Sunnis before. Such was justice, and through it Junayd was freed of all blames of heterodox beliefs. It is said that when al-Hallâj, the notorious pantheist and thé example of Ibn ‘Arabi and his likes, separated himself after a conflict with Abu ‘Uthman ‘Amr al-Makki, a pious sufi with sound beliefs, he came to Junayd. Sahl b. Abdallah al-Tustari is a pious sufi with sound beliefs. Indeed, the Salimiyyah sect that has been found by Ibn Sâlim and his son, both students of Sahl, is based upon statements, acts etc. from the latter. And most of it is sound and agreeable, except a small part not. But in general, their doctrines about Allah, the Exalted, and His Attributes is sounder than that of the later Ash’arites and far better than the Mu’tazilites. Abu Talib al-Makki, author of the Qut al-Qulub, and Abu ‘Ali al-Ahwazi, author of the refutation of Abu’l-Hasan al-Ash’ari, are considered Salimites. Junayd was of sound beliefs, agreeable to the Sunnah. This is bared by his teachers, the advises of his teachers against Kalâm and the Mu’tazilah (who were the only people then who interpreted away Allah’s Rising, for al-Harith and Ibn Kullab never ever did that), his relationship with al-Harith al-Muhasibi, with that of other personalities such as al-Hallâj, his views about men like Sahl al-Tustari (who kissed Abu Dawud al-Sijistani’s tongue because of the sunan that flowed from his lips), ‘Amr al-Makki, Ibn Surayj and many more. Junayd authored also many works, that is: rasa’il. Junayd’s Rasa’il are famous, like al-Muhasibi’s books. Many of his Rasa’il are about Tawhid. The famous statement cited above, i.e. the separation of Allah from all that his created, is cited by Abu’l-Qasim al-Qushayri, the Ash’arite sufi, in the beginning of his book famous al-Risalah fi al-Tasawwuf. Ibn Taymiyyah wrote a commentary on the Risalah, in two volumes: Kitab al-Istiqama. It is one of the most excellent books I ever read on ‘tasawwuf’ containing so much Fawa’id. He mentioned al-Qushayri’s quotation and commented upon it, against al-Qushayri’s understanding and that of other Kullabite-Ash’arite scholars who deny the Attributes of Will. If one desires knowledge about Junayd’s beliefs, take recourse to that splendid book. Therein is also mentioned that the Sufis in general, from the earliest day until the second half of the 5th century were upon sound beliefs; only after Abu Abd al-Rahman al-Sulami and his likes the Kullabiyyah (or Ash’ariyyah) influenced heavily the sufis, until al-Qushayri’s Risalah sealed it with the impression that Sufism and Ash’arism are twins that are not separable of each other. Truth dictates otherwise, as I’ve referred more than once how sound sufis opposed the Ash’arites. However, we must not free Junayd of possible mistakes. As many sufis, he has some sayings that are problematic somehow. That is mostly because of his style and that of his colleagues. This is sufficient for his affirmation of al-‘Uluww. There is also a statement ascribed to Ibn al-A’rabi, concerning Istiwa’. It is said that Ibn Abi Duwad, the Mu’tazilite, went to him or made someone ask him if Istiwa’ could mean Istawla of something alike. Thereupon Ibn al-A’rabi denied that and silenced the man. I think this is the linguist Ibn al-‘Arabi who lived in Ahmad’s days, and not the student of Abu Dawud al-Sijistani, the Tunesian Ibn al-A’rabi who authored the Tabaqat al-Nussak who was also a close student of Junayd born in 247 and died in 341 AH. Anyway, Junayd had sound beliefs when it came to Allah’s Names and Attributes. This can be seen in the statements reported from him and from his writings, beside his association with other Sunnites and the passage of his life. 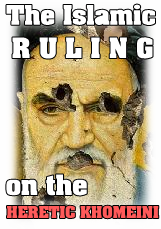 ← Sunni community of Tehran demands BASIC rights!